Landing Pages with countdown timers are very cool. Experiments have shown that these countdown clocks and timers help improve conversion rates. They give a sense of urgency to the page visitors without coming across as too pushy! When I think of countdown timers I am reminded of New Year’s eve. It’s a time whenever everyone across the world is counting down together. You can use a custom timer for your event landing pages. Maybe a birthday party or a mega corporate bash. 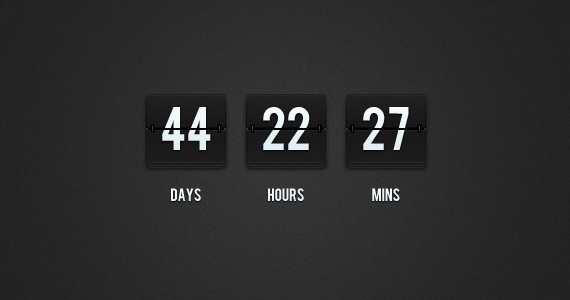 Creating a countdown timer has never been easier. First, select a starting point – either a ready made template or build from scratch. Or you could build your own using the countdown element in our builder. 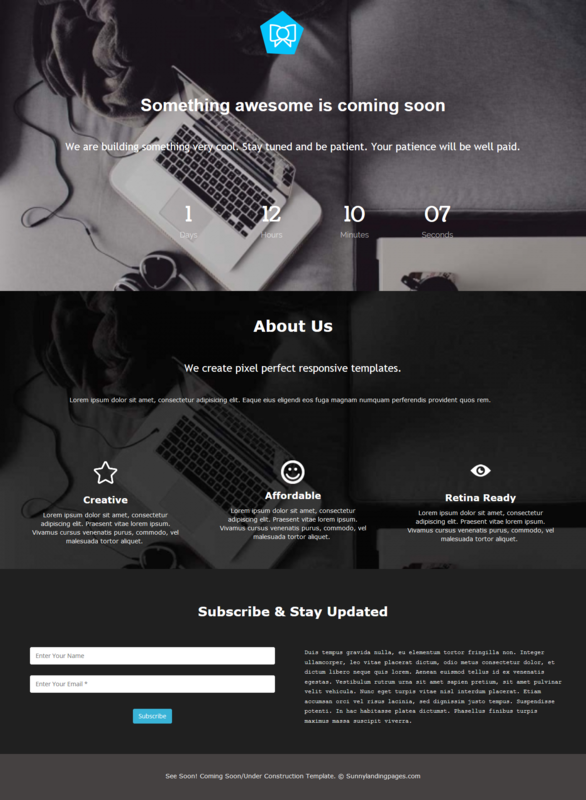 Once you have selected ‘Build Your Own’ option for the landing page, then on the left panel you will notice the countdown element. Click on the element to launch the timer builder. 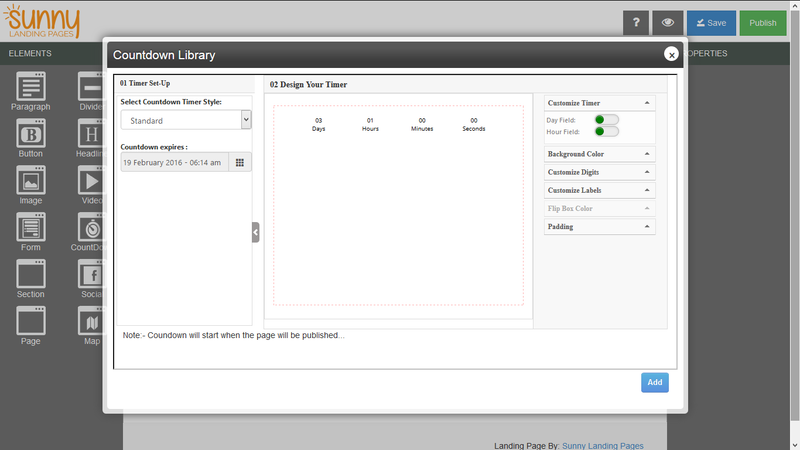 Here’s a screenshot of the countdown timer element in the landing page builder. On the left you see two options to set up the timer – selecting the timer style and setting up the countdown duration. Next, set the deadline date and time. The builder gives you an option to program your countdown timer to display Days, Hours, Minutes and Seconds. You can hide the Day field and / or the Hours field if you want to. 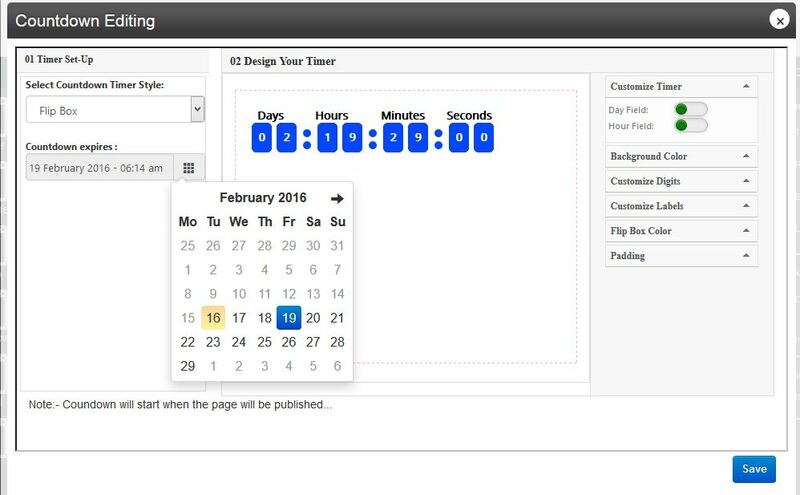 Once you have selected the date and time and what type of timer you want to display you can now design your timer. You can customize the background color. Here’s a tip from my side: for a professional looking design you layer the timer on top of an image and keep the timer background color as transparent. You can customize the digits by selecting fonts, font size, font weight and color. You can customize the labels by renaming days, hours, minutes, seconds and similar to digits you can change the font with it’s size, weight and color. For the flipbox, you can choose the color of the flipping boxes. Finally, similar to all other elements in the builder, you can re-size, drag and drop to place your timer, set the padding margins. If you want to hide the element in the mobile version then you can select that option in the properties panel on the right. And – That’s it! You’re done. You’ve got your own countdown timer in your landing page. Here’s one more ready-made countdown template that you can use as a starting point. Makes you want to book that next holiday, doesn’t it? Make sure you have a strong Call To Action associated with the timer. It’s not enough to build a general sense of urgency. Make it easy and straightforward for your audience to click through to your detailed page or to leave their contact information so you can start the lead engagement process. So what are you waiting for? Build your own free landing page with a countdown timer using Sunny Landing Pages. Your first 3 pages are free for life and the upgrades are affordable too.